The Gardner Historic House: Welcome! The Gardner House is an early 19th century brick hall-and-parlor house located on the Upper Green River Biological Preserve. 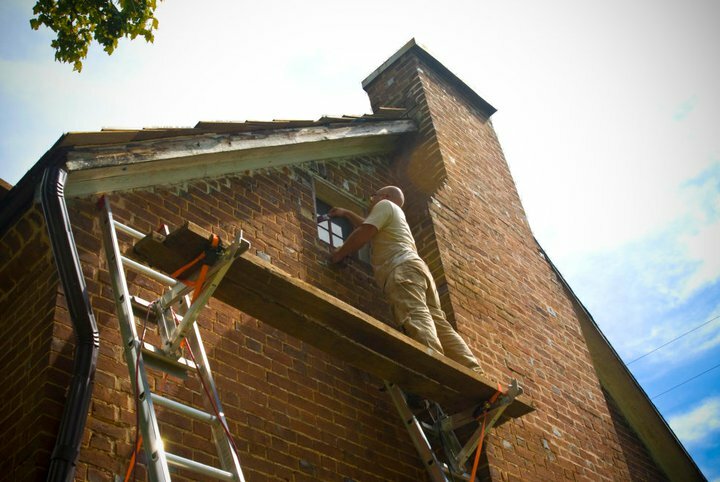 The Flemish bond house is one of the oldest homes in Hart County and, despite the care taken by owners over the years, at the beginning of the 21st century, its age was definitely showing. This historic house has now become a restoration project for Western Kentucky University's Department of Folk Studies & Anthropology, providing hands-on training in historic preservation to WKU students. Since 2003, students have been active in researching and documenting the structure. The first step was a student project to develop a Cultural Resource Management Plan and nominate the structure to the National Register of Historic Places. Students, directed by Tonya Taylor, then "mothballed" the structure to prevent further deterioration. 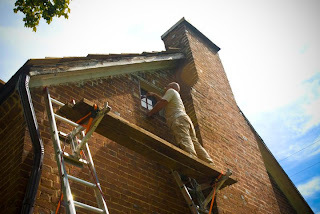 Subsequent student projects, directed for two years by Taylor and then by James Miller (pictured here), have included replacing mortar in the house, adding new gutters, replacing the roof, and repairing and replacing historic windows. Though the restoration is not yet complete, many hours of work by several classes has made quite a difference. The Department of Folk Studies & Anthropology is pleased to invite the public to view the process of preserving this priceless piece of Hart County history. An open house will be held on April 29 and 30 from 10-4 each day and will include tours of the house, live music, and exhibits focusing on preservation and Hart County Life. All members of the public are welcome, including school groups, but appointments are required. To reserve your place, please email gardnerhousemuseum@gmail.com with the time you'd like to stop by. Directions will be provided. Please stop back by for updates and more information on the Gardner House!